Learning guitar is easier with tabs. Not all musicians want to take the time to learn music. Tabs are an easy way to sit down and get started without having to study notes or key signatures. While traditionalists may argue that tabs rob a guitarist of fundamental musical knowledge, not all musicians are looking to learn the technical aspects of their instrument. In this article we will discuss Christian guitar tabs; how to read guitar tabs, their benefits, uses, and where the best places are to find them. If you want to use tabs, there are a few things that you should understand. The first is that tabs tend to go from lowest to highest, top to bottom. This means that you will technically be reading the frets backwards. The lowest strings are on the bottom, while the highest strings are located at the top. The numbers on a tab don’t represent the string number; they represent the fret number. Take for instance the number three. If we have the number three on the lowest line, it represent the third fret of that strings. This tab is telling us that we are to play the third fret of the low E string. The benefit of tabs is that they are easy to use. Not all of us want to sit around learning how to read sheet music. When it comes to ledger lines, music only grows more confusing. Tabs are an easy way to simply play. You don’t need to study or worry about anything; just play the frets that are shown. The downside is that tabs don’t include note values. This means that when you are learning a song using tabs, you will have to play along to the song and figure out the note values for yourself. This is fairly easy to do; just hold the notes until it ends in the song. They are made so that any guitarist can learn to play any song that they wish without any prior musical knowledge. Finding tablature is easy; there are a ton of sites online that offer free guitar tablature to thousands of songs. One of the best sites to use for Christian guitar tablature is christianguitar (dot) org. 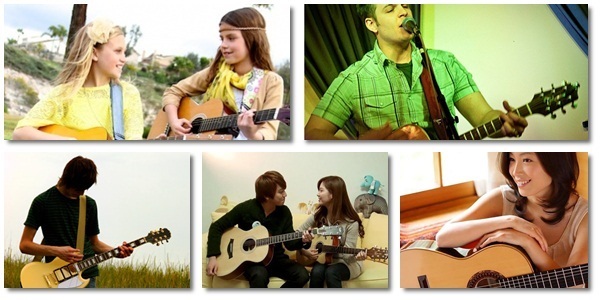 The site is directly geared towards Christian guitarists and musicians. It contains tabs, lessons, as well as links to video lessons. In the end, using guitar tabs to learn your favorite Christian guitar songs is easy. All you have to do is look of the song, find the tabs, and practice. Make sure that you are playing along to the song to get a feel for the notes values and placements. If you come to a particularly difficult passage, break it down into sections and take your time with each. Have fun, and good luck! If you want to cut down the time in learning worship guitar, make sure you check out this course for learning to play worship guitar songs.